Lately there have been a number of steakhouses that have opened, with the new additions being Ruth Chris and Wooloomooloo. I have tried both including Morton’s and The Cut. Funny enough, each one has differing attributes that make them stand out. 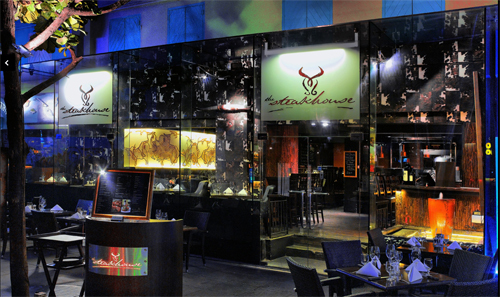 The Steakhouse in Clarke Quay has been opened for over 5 years and last week I decided to check them out to see how they stood against the competition. The Steakhouse is located in The Foundry block, behind the Clarke Quay taxi stand along River Valley Road. The signage on the outside is not very noticeable so it is easy to miss it. Inside, the restaurant is dimly lit and there is extensive use of dark wood. This gives a rather posh and romantic ambience which explains the number of couples dining there the night I was there. You know this place is serious about its meat when the walls feature paintings of bulls including a miniature bull on the shelf behind the bar. 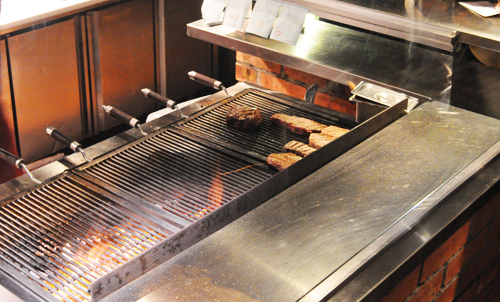 There is also an open charcoal grill where you can watch as the chief griller expertly moves your steak from side to side, section to section depending on the doneness of your steak, the shape, thickness of your steak and the heat of the grill. Every now and then, he rouses a fire to get a nice charred exterior to the steak. We started with a bunch of appetizers to share namely the walnut and blue cheese salad, steak tartare, escargots and crab cakes. The salad which consisted of baby spinach and rocket was well tossed with raspberry vinaigrette and the bitter sweet walnuts complemented the blue cheese and poached pear. 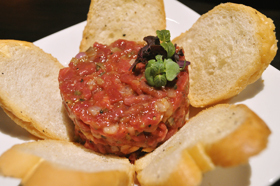 The steak tartare was decent in terms of the seasoning however you could taste the beefiness of the meat which was certainly a preview of what was to come. The escargots came drowned in garlic herb butter which for me is a great thing as I had so much fun lapping it all up with the toasted bread. 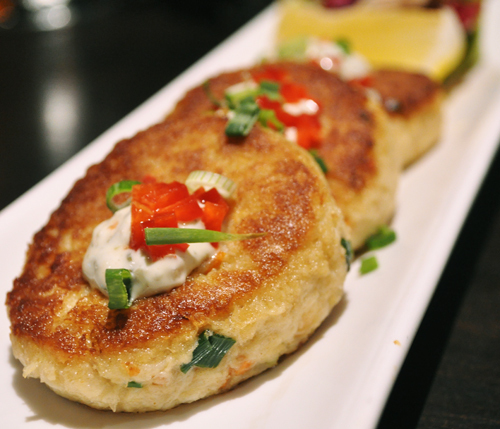 The crab cakes were nice and crisp on the outside and the inside was loaded with chunks of crab meat which was full of flavour. There was guacamole and remoulade served with the crab cake. It still can’t beat the best crab cakes I had at The Ivy restaurant in LA. For the mains, I shared an 18 – 20 oz. 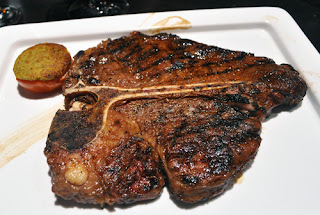 (510 – 566g) Australian Angus grain fed porterhouse with my wife. Before I get to that, I’m going to sidetrack briefly. I don’t understand why steakhouses in Singapore have to follow the U.S. metric system when indicating the weight of the steak. Wouldn’t it make more sense to just use grams so we don’t have to guess, google or ask the server? Ok back to the steak. The porterhouse is part of the shortloin which consists of the sirloin on one side of the bone and the fillet (tenderloin) on the other. Part of the steaks that come out of the shortloin are called T-Bone steaks however those pieces have the sirloin on one side of the bone and hardly any fillet meat on the other side. The porterhouse is a great cut because it gives you two types of enjoyment and choice. In the case of sharing with my wife, she prefers the leaner and more tender fillet section while I prefer the more marbled sirloin which has a nice strip of fat that runs along the side. Every slice has about 10% fat and 90% meat which makes for excellent juiciness and flavour. If I were to eat the porterhouse myself then I get to experience two rather different textures. Of course if you are a true carnivore, you also get to enjoy sucking on the bone. My parents had an 11 oz. (311g) Australian Angus grain fed ribeye steak. Apart from the large eye fat which is typical of a well fed marbled ribeye, the piece looked wonderfully grilled and both came to the exact doneness we asked for. It was pure heaven to get the initial smokiness from the charcoal followed by the sweetness of the meat and the lingering beefiness. Though mine came with pepper sauce which tasted good, you really do not need any sauce with good meat. We had sides of asparagus, cream spinach, sautéed mushroom and potato gratin. The asparagus had a lovely crunch and was like a sponge soaking all the smokey flavour. The cream spinach was divine as well, not overly chopped/blended so that it still retained a good texture. The sautéed mushroom could have done with some more herbs and garlic however the potato gratin was close to perfect. The slices of potato had a good texture and were kept sufficiently moist from the cream. Overall the experience at The Steakhouse is good. While the service levels cannot be compared to Morton’s or The Cut, the prices here are lower. Morton’s steaks cooked in a custom broiler retains its juiciness and tenderness better however it lacks flavour. The Cut tries to do a mixture of charcoal grill while finishing off in the broiler which is good but I had my steak come out room temperature once. Its not hard to see why The Steakhouse has been around for over 5 years but it must definitely continue to provide good value for money if they want to survive in the increasingly competitive steakhouse market. Huber's Butchery paid for its meal at the eatery mentioned above.